Sometimes the most beautiful things come in the most unassuming packages. When my parents told me they'd bought me a bracelet while getting their annual check-up at Mayo Clinic in Rochester, I wondered what kind of bracelet they could have found in Minnesota. If you've been to Rochester, it's a town that centers around the medical facility – not the sort of place you'd expect to find a jewelry store with fine estate jewelry. Looks can be deceiving. 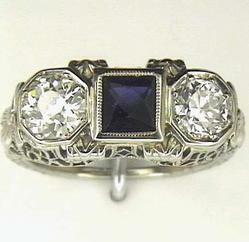 Hight & Randall Personal Jewelers has some lovely estate pieces. The bracelet my parents selected would perfectly match the lovely ring in the photo above. Be warned: their website is terrible – hard to negotiate, easily tripped up. But if you can stand it, you might find something beautful. And hey, if you find yourself passing through Mayo for a few medical tests, take the edge off and stop by. Photo above is from secure.personaljeweler.com. If you've got an eye for fashion, set your sights on this ultra-feminine accessories line from jewelry designer and stylist Ranjana Khan. With more than a decade of experience, Ranjana creates an eclectic and unexpected collection that mixes metals and luxurious fabrics in a truly unique way. Any of these one-of-a-kind designs give you the dramatic difference you've been searching for. Flutter with the feminine delights of this necklace. This fancy-free design highlights your neckline in girly detail. A detachable butterfly-design pin pairs well with the braided necklace, but also stands out on your favorite blouses. 69-1/2" long. 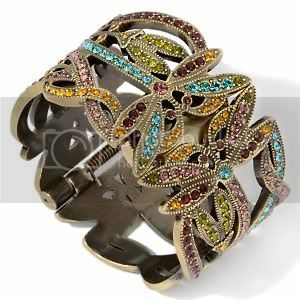 Vivid hues blossom with brilliance upon this Flower-Design Mesh-Like Bangle Bracelet. Take your basics from day to night as you pair this bold bauble with your personal style. Red or Yellow. Chunky black and graphite-hued acrylic links suspended from grosgrain ribbon. This gorgeous vintage-inspired jewelry is made in India, using lots of colorful ribbon, lace, and textiles to offset the shiny metal, creating an interesting play on color and texture. 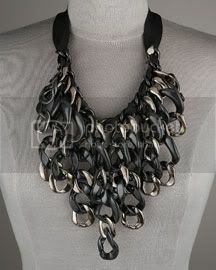 Braided chains and chunky statement pieces add lots of interest to the neckline of any ensemble. Heidi Daus has spent the last 25 years designing her jewelry with spirited innovation. Her love for vintage and estate jewelry, and exotic stones has helped to create artful designs that command attention. Her collectible looks transport you to an era of high romance, Baroque lavishness and art deco chic. You will find her treasures throughout the world, with each style's classic beauty being timeless and elegant with a flair for the dramatic. The Heidi Daus Jewelry Collection can be found in specialty boutiques, and gift and museum stores across the United States and abroad. Hinged to reveal a subtle goldtone watch case, this substantial cuff features an open floral and dragonfly design covered in round pavÃ©-set aquamarine, light purple, dark purple, olivine and topaz color crystals (approx. 1 to 3mm). Upon both necklaces-1 long, 1 short-a single row of individually knotted beads (approx. 4mm to 12mm) showcases a sparkling 3-tier cap of pavÃ©-set, round crystals at each end. At one end, a geometric center station swathed with pavÃ©-set, round crystals is sandwiched between two open circle stations. The circle stations also boast glimmering pavÃ©-set, round crystals. The versatile necklaces can be worn alone for subtle sophistication, worn together for a contemporary layered look, or attached at the clasps for a luxurious lengthy look. A study in shapely sophistication, this bangle bracelet showcases multiple rows of glistening pavÃ©-set, round black diamond-color crystals. 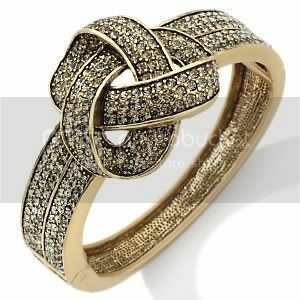 An intricate "knot" in the center also boasts a romantic canvas of pavÃ©-set, round black diamond-color crystals. Although her mosaic designs are constructed in Art Deco fashion, her fanciful jewelry is actually inspired by nature. Flowers, insects, foreign lands, and Heidi's own lush garden have influenced her creations. The end result is a beautiful vintage look with frequent natural themes. Because of the difficulty in producing her product, Heidi Daus is in a class by herself and there is simply no one left that is willing to make this sort of complex costume and semiprecious jewelry. Since it was established in 1764, Baccarat has continued expanding its influence, inspired in roots stemming from an ingenious handcrafted work of the highest quality, throughout the world. The creations of great artists inspired by the magic of crystal are all magnificent stones brought together to build the Art de Vivre collection. This is how Baccarat perpetuates the great French tradition of the cosmopolitan art of living. Envisioned by Philippe Starck, the Baccarat House in Paris, home to the brand's headquarters, is a meeting place for its most beautiful creations. Baccarat restates its fine jewelry making status by giving crystal a new image. In the never-ending whirl of fashion, the ageless beauty of crystal is caught in Baccarat jewelry. Baccarat has successfully created a delicate complicity between the eternal and the ephemeral. They meet every season around a star of light, both solar and lunar, that which is known as crystal. Since 1991, Jaime Byrd, an award-winning jewelry designer, has created hair ornaments and jewelry that are original in design. Many of her pieces are loosely based on vintage jewelry, and some designs are influenced by art over hundreds of years old. Jaime has maintained a fascination with the Victorian and Edwardian eras, and has used this love to guide her, while also infusing a contemporary look to her work. Jaime's hand painted flexible grapevine bracelet with Swarovski Austrian Crystals has tiny crystals on grapes to add special glitter and shine! This bracelet is adjustable up to 1 inch with an extender. Brass and silver pieces are antiqued and polished resulting in an Old World finish. Many items are hand painted, and then sealed with a light coat of lacquer. 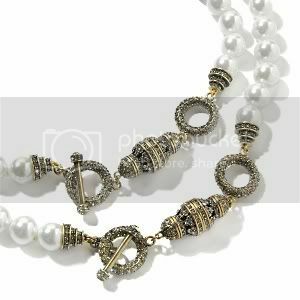 Genuine Swarovski crystals, freshwater pearls, and gemstones are added to create romantic and vintage-inspired pieces. This exquisite necklace from Byrd Designs is a perfect blend of beauty inspired by nature and the rich style of the Victorian era. Hand-painted flower stems, alight with sparkling crystals, lay in a graceful wreath about the neck. Great pride is taken in the quality of all her work, and each piece is handcrafted in Jaime's studio, using only superior materials and workmanship. From the ornate filigree setting to the dancing row of Swarovski Austrian crystals, these mini-chandelier earrings are long on both style and character. Available in all Swarovski Austrian crystal colors, these earrings hang 2" from the ear, are hypoallergenic, nickel free, and are available in clip-ons. Byrd Designs items have been seen in feature films and in fashion magazines including InStyle, Bride, Collector's Edition, and Upscale. Jaime has participated in art shows on the West Coast for many years before moving to North Carolina in 1999. You can now see her at various Art shows in southeastern US. I am inspired by nature. There is no doubt, by looking at my designs, that I love the outdoors and gardens. I love flowers, butterflies, dragonflies, and fairies. Also, color is a huge inspiration for me. I am also a painter and therefore I often find myself combining and blending colors in jewelry in very much the same way I would in a landscape painting. Blending cool and warm colors can often bring together new and exciting pieces of jewelry that are unique and can be worn any time of year. I love that! I was born and lived until I was 30 years old in Los Angeles, California. I went to school and studied Fine Arts and music at California State University of Los Angeles. When I left LA, I moved to Arcata, in Northern California, where I started my current company, Byrd Designs. I lived in Kauai, HI and then moved to Hood River, OR for 6 years. I finally settled in the beautiful western North Carolina mountains near Asheville where I currently live in the woods with my husband and our blind blue heeler dog, Lyle. eBay, schmee-Bay. Everyone knows about eBay, that it's not only a source for electronics and Louis Vuitton knock-offs, but also a great place to find jewelry. eBay has lots of interesting contemporary and vintage jewelry…but you have to wade through 20,000 pages to find what you're looking for. For the more discerning (or more impatient) lover of jewelry, be it estate, vintage, or contemporary high-end designer, there's Trocadero.com. I found the amazing ca.1950s 14K gold, Persian Tuquoise, and Pink Sapphire ring there (above). So colorful and fun! Trocadero bills itself as "the essential to buying & selling fine arts and antiques online." It's a site with little online stores by antique and collectibles dealers, with an efficient search function and easy-to-use layout. Every dealer maintains his/her space, and ships the pieces themselves. And the variety of jewelry here is outstanding: you have everything from platinum estate jewelry to 1980s gold by Paloma Picasso for Tiffany to watches modernism to art deco…and more. And we all know, vintage is never out of style…many of the pieces are super-trendy, in fact. Check out this unbelievable brass neckpiece from Art Smith, a 1950s Greenwich Village jeweler and a pioneer of the modernist style whose influence we all still see today. While much of the jewelry on Trocadero is sort of serious, there's always a little kookie something here and there. I just had to show this little Bakelite pig pin from the 1930s. Oink Oink. Have fun searching…and let me know if you find any excellent pieces or designers I should investigate further! Hi everyone – I'm Victoria, your new blogger for The Jewelry Weblog! I'm very happy to be here and share my jewelry passion with you. You can read a little more about me on my profile page, but forget about me for now, let's talk about jewelry! So…my first post is about a cool and little-known museum with an exhibit on silver jewelry from around the world. Why an exhibit? Well, in addition to being a jewelry designer, I'm also an historian and collector of jewelry, and always take inspiration from vintage and ethnic jewelry. So when I caught of glimpse of the goings on at The Bead Museum in Arizona, I wanted to share it with you. This unique space was founded "to establish a safe haven for a permanent collection of beads and adornments of all cultures, past and present, which would provide an enduring opportunity for the study and enjoyment of these magnificent examples of art and ingenuity. In addition to historic collections, they feature works by contemporary bead designers in all mediums. Right now, they have what has to be a wild exhibit called Silver: From Fetish to Fashion, and it features absolutely fab ethnic pieces from around the world, like the exquisite silver collar above. This piece have been inspiration for Pierre Cardin's futuristic jewelry pieces from the 1960s, OR a even current piece from Pianegonda, the stylish Italian jewelry firm with love for bold and chunky designs. Talk about fetish AND fashion! Today I'm in a class jewelry mood, so I took a tour of the Melody NYC jewelry site, and boy, what a great find! They carry all kinds of great vintage jewelry organized per period: Georgian, Victorian, Edwardian, Art Nouveau, Art Deco, and Art Moderne. So, there's something there for just about any vintage jewelry taste you might have. Pictured above is a Austrian/Hungarian Necklace: Elaborate, texturized, enamel, garnet, pearl, lapius, necklace. Originally mounted in silver, vermeiled. After seeing that Earthly Adornments added a new line of vintage jewelry to their inventory, I realized, duh!, I should have a category for that here. Funny how I can write about jewelry year after year and never get it completely covered. Webstore owner, Caryn Naiditch, recently traveled to the east coast from the Sebastopol, California based Earthly Adornments to acquire the jewelry collection from the estate of lifetime collector and world traveler. This unique collection of high quality vintage jewelry will delight customers. "Finding a collection of this caliber is always exciting. One of the most fascinating pieces in this new Collection is an Egyptian revival jeweled collar that Katherine Hepburn reportedly wore in a theatrical production of Cleopatra in Connecticut. Imagine wearing a piece that was worn by a screen legend. The history of these pieces is part of the fun in owning them," said Naiditch. "My mother and sister were avid jewelry collectors and this woman's collection rivaled theirs in the uniqueness and variety if not the sheer volume. I work hard to find the most wonderful and distinctive pieces to offer at EarthlyAdornments.com. This amazing vintage jewelry collection certainly fits the bill." The bracelet pictured above is art deco constructed with filigree brass with a Czechoslovakian glass cabochon in the center. Here are some more items from the collection, but to see it all head to the site. There's a lot there! Carved from a solid block of midnight-black onyx, the body of the locket holds a recessed compartment hidden in the back that can hold a memento, photo or painting. Vintage earrings of faceted Czech jet glass suspended from tiny black jet beads. New sterling silver earwires.